Soften butter, but don’t completely melt. Heat milk to lukewarm – between 37º and 40ºC. Place butter, milk, extract & egg into the bread machine. Add remaining dough ingredients and set on a dough cycle. For the filling, soften the butter and stir in cranberries, chocolate & sugar. Once dough is ready, gently roll out on a lightly floured surface to a 45 x 20cm rectangle. Spread filling evenly over the dough, leaving a 1cm gap down one long edge. Roll dough into a scroll, ending with the long side that is free of filling. With the seam on the bottom, cut the roll into 12-16 even sized slices. Place scrolls into a lasagna sized lined baking tin. Cover with a clean tea-towel and sit in a warm place until the scrolls have doubled in size. Bake in a preheated oven at 225ºC for about 10 minutes. To make the icing, combine the berry syrup & icing sugar then add sufficient hot water to make a spreadable glaze. Spoon into a piping bag and pipe icing over the buns. Store buns in an airtight container. This is my first entry into a monthly chocolate challenge We Should Cocoa. 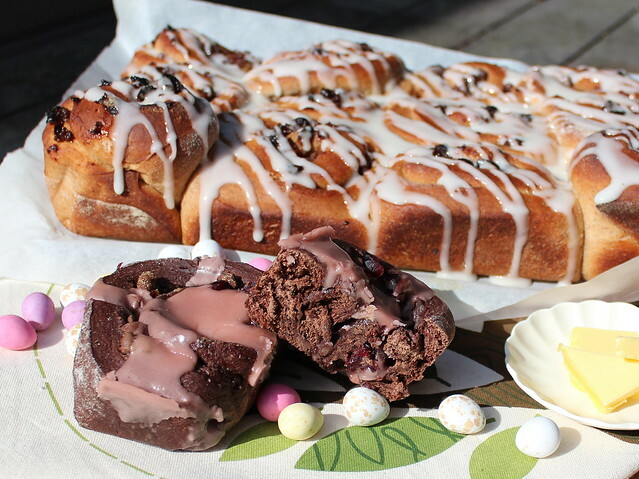 This entry was posted in Baking, Bread and tagged bread scrolls, Easter baking, scrolls by Jo Dohrman. Bookmark the permalink. Spiced Berry Syrup – I have used Shott Spiced Berry Syrup. If you haven’t got any, then either use a berry extract or berry cordial such as Blackcurrant Syrup. I have a post coming on how to achieve berry flavouring using other options. Huge apologies Jo. 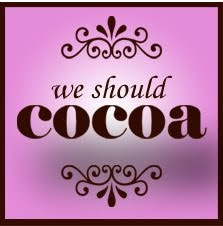 I’ve just discovered this on the We Should Cocoa e-mail. As we use the linky thing now, I don’t check it nearly as often as I should – as you can probably tell. Please don’t let this put you off entering WSC again. your entry is fantastic and your photo is gorgeous. Thanks for your feedback – I wondered if I had made an error somehow on the entry. I will enter again sometime in the future.